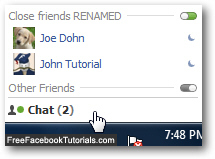 The previous tutorial explained how to create a friends list for Facebook Chat. 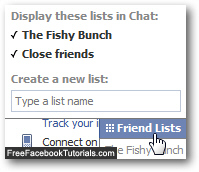 The name you picked for your new friends list will be used to refer to that group of friends inside the Facebook Chat client, as shown on the screenshot below, and elsewhere in your Facebook profile where you can manage your friends (something you'll see in our "Delete a friends list on Facebook Chat" tutorial). First, we assume that you are already logged in to your Facebook account; if so, you will see the "Chat" button in the bottom right corner of the screen: click on it. As soon as you do, Facebook will open the chat client; you should see a listing of all the friends lists you have created; if you don't see the friends list you want the rename, you probably hid it, voluntarily or accidentally: show hidden friends lists on Facebook. Once you see the friends list whose name you want to change, move your mouse pointer (cursor) above it, and Facebook will display an "edit" next to its name: click on it. Erase the current friends list's name, and type a new word or sentence to rename it; once you are done, hit the Enter / Return key on your keyboard, and Facebook will rename the friends list in question. Now click on the "Save List" button to return to Facebook Chat, now minimized. Click on the "Chat" button at the bottom right, and Facebook will expand the chat client, now showing the friends list under its new name: everything else remained exactly the same. And this is how easily you can rename a friends list on Facebook Chat! If you no longer like your friends group's new name, follow the steps outlined above, and rename the friends list back to its original name.